Digital Equipment Corporation, Intel Corporation, Xerox Corporation (September 1980). "The Ethernet: A Local Area Network". ACM SIGCOMM Computer Communication Review. 11 (3): 20. doi:10.1145/1015591.1015594. CS1 maint: Multiple names: authors list (link) — Version 1.0 of the DIX specification. Charles E. Spurgeon (2000). 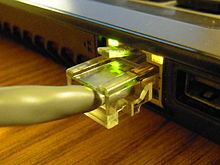 Ethernet: The Definitive Guide. O'Reilly Media. ISBN 978-1565-9266-08. ↑ IEEE 802.3 'Standard for Ethernet' Marks 30 Years of Innovation and Global Market Growth. IEEE. June 24, 2013. http://standards.ieee.org/news/2013/802.3_30anniv.html. Retrieved on 11 ਜਨਵਰੀ 2014.